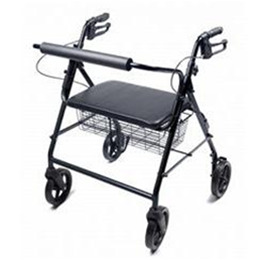 The Lumex Walkabout 4 Wheel Imperial (Bariatric) is ideal for larger individuals. Similar to the Walkabout Lite, this rollator offers a comfortable, lightweight and affordable solution to mobility. Designed with an aluminum frame, this lightweight rollator weighs 20 lbs and supports up to a 500 lb weight capacity. The Walkabout folds quickly and easily into a compact unit for storage and transport.Features:• Ergonomic hand grips • Easy to operate locking and “quick stop” loop brakes (pull up to stop; push down to lock) • Padded 20" wide seat for increased seating surface and added comfort • Removable padded backbar • Adjustable handle height to accommodate broad range of user heights • Durable, heavy duty 8" wheel for indoor and outdoor use • Basket included that can be placed underneath seat for carrying of personal items • Designed to meet the requirements of HCPCS codes: E0149 & E1056 • Includes easy to read, retail-friendly user manual • Lifetime Limited Warranty And now with added rear reflectors that increase visibility at night!